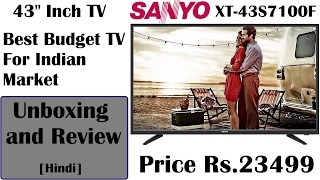 The lowest price of Sanyo NXT 108.2cm (43 inch) Full HD LED TV(XT-43S7200F) was obtained on April 25, 2019 1:39 am. What if we tell you that you can watch TV and make the world a better place at the same time? Don’t believe us? With high BEE ratings, this TV saves the planet (and your pocket) by consuming lesser power than its lowly rated counterparts. Kiss your tension goodbye with 300+ expert service centers across the country. The TV panel are also rated to last for 10 years so that you needn’t worry about replacing your set for a long time. On top of that, every Sanyo TV undergoes 24 stringent quality checks to iron out defects. Prompt delivery before mentioned date. Wonderful product. Thank you amazon for providing nice product at best price. Delivery before a time.amazing product gud sound and picture quality.thnx Amazon. Excellent value for money with excellent picture quality and reasonably good sound. A good product considering the cost. Bought mainly as Sanyo is a part of Panasonic some of whose products like CD Player, VCR, and LCD TV are still being used by me. This is excellent TV with good viewing angles, but fast action like sports may leave a little more to be desired.